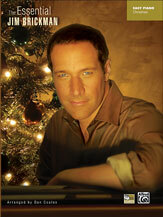 The music of Jim Brickman has delighted music lovers for nearly 20 years. This collection features his most popular and beloved compositions for the holiday season. Titles: Angels * Early Snowfall * Even Santa Fell in Love * The Gift * Greensleeves/Carol of the Bells * Hark! The Herald Angels Sing * If You Believe * Joy to the World * O Holy Night * Peace (Where the Heart Is) * Sending You a Little Christmas * Silent Night * Silver Bells * Snowflake * Winter Peace.